Traffic congestion, road accidents and vehicles with four wheels could soon become a thing of the past if executives at an ailing U.S. car giant get their way. 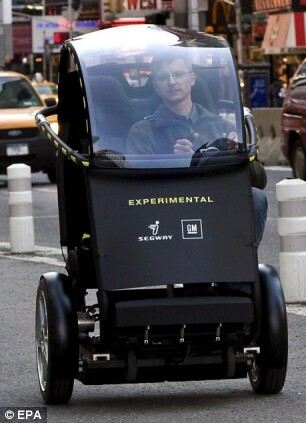 General Motors have teamed up with electric scooter maker Segway to develop a two-wheeled, two-seat electric vehicle designed to be a fast, safe, inexpensive and clean alternative to traditional cars for cities across the world. 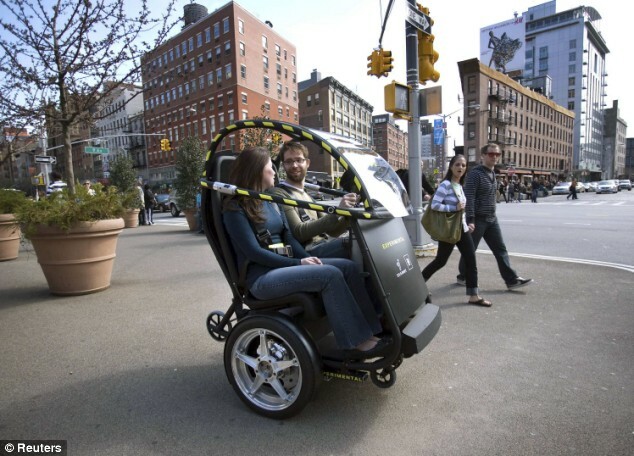 The prototype runs on a lithium-ion battery and uses Segway's two-wheel balancing technology, along with dual electric motors. 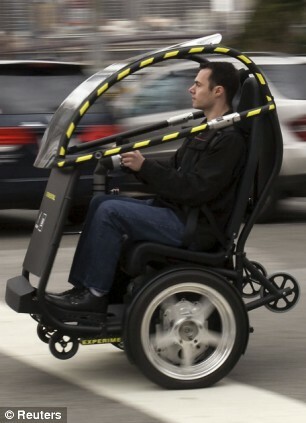 It's designed to reach speeds of up to 35mph and can run 35 miles on a single charge. 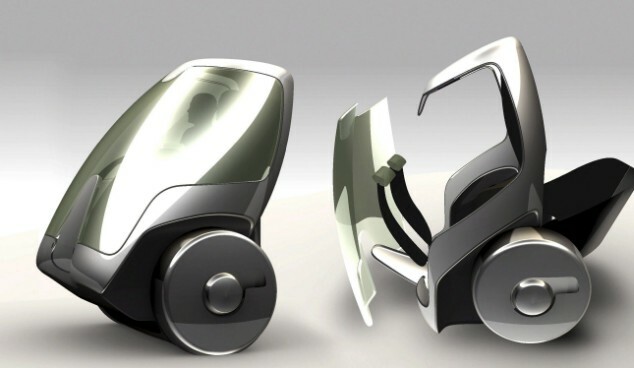 The companies did not release a projected cost for the vehicle, but said ideally its total operating cost - including purchase price, insurance, maintenance and fuel - would be about one-third of that of the average traditional vehicle. Larry Burns, GM's vice president of research and development, and strategic planning, said the project is part of Detroit-based GM's effort to remake itself as a purveyor of fuel-efficient vehicles. If Hummer took GM to the large-vehicle extreme, Burns said, the PUMA takes GM to the other. Ideally, the vehicles would also be part of a communications network that through the use of transponder and GPS technology would allow them to drive themselves. The vehicles would automatically avoid obstacles such as pedestrians and other cars and therefore never crash, Burns said. As a result, the PUMA vehicles would not need air bags or other traditional safety devices and include safety belts for 'comfort purposes' only, he said. Though the technology and its goals may seem like something out of science fiction, Burns said nothing new needs to be invented for it to become a reality. 'At this point, it's merely a business decision,' he said. Burns added that while putting that kind of communications infrastructure in place may still be a ways off for many American cities, the automaker is looking for a place, such as a college campus, where the vehicles could be put to use and grab a foothold in the market. There's no timeline for production, Burns said. The ambitious announcement also comes at a time when GM's future is hanging by a thread after receiving billions of dollars in federal aid and is in the midst of a vast restructuring that could still lead to a filing for bankruptcy protection. Meanwhile, the ongoing recession has resulted in some of the lowest industrywide vehicle sales in more than a quarter century. But Burns argued that some of the most revolutionary ideas have been born out of tough economic times. 'The next two months, and really 2009, is all about the reinvention of General Motors,' he said.